I’m delighted that we all seem to have survived the Mayan Apocalypse, but knitters know there is another End of Times deadline looming. There’s less than 24 hours to go until you need to have those handknits finished, wrapped and under the tree. If you are still a present or two down, or you’ve just discovered an unexpected guest will be arriving tomorrow, try not to panic, and instead grab the ultimate cheat in handknit gifts – a chunky cowl. 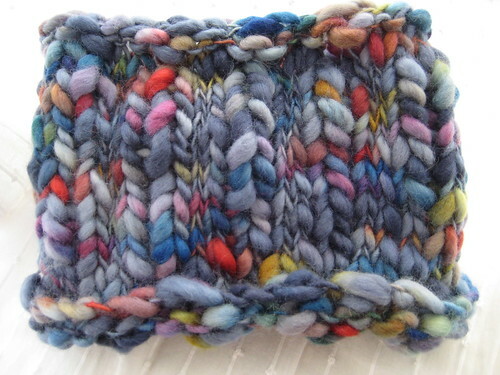 For this, you will need a single skein of something chunky and, hopefully, unusual or colourful. The yarn is going to do all the hard work for you, all you need to do is cast on a reasonable number of stitches (guesswork and commonsense should serve you well here), knit in the round until you almost run out of yarn and then cast off. I made this one with a skein of Colinette Point Five. If you’re a fast knitter, you could make a long Honey Cowl (or shorten the pattern if time and yarn supplies require it), and the lovely SSC pattern shows how you can make plain yarn look great simply by turning it inside out. Or for something a little different you could try the Bandana Cowl. I still have a pair of socks to finish by Boxing Day. And the cardigan remains a work-in-progress. But I can live with that. If you’re also still knitting, I hope you won’t let it drive you crazy. No one will mind if a gift or two is a little late. The world won’t end, you won’t get arrested, and your loved ones won’t desert you. At some point, it’s time to put down the needles, pick up the eggnog/mulled wine/cup of tea and join the festive fun. This entry was posted in Knitting and tagged Advent 2012, Christmas knitting, cowl. Bookmark the permalink. beautiful colors. Hope you had a very merry.